So, you have a 100-lb. 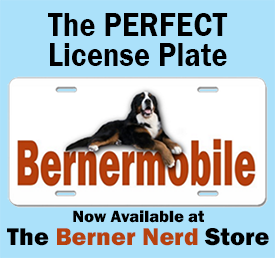 Berner that loves his walks and wants to bolt out the door with you flying behind him like a magic carpet. If you have a stay/wait command, it’s easy to train a dog to wait for you to go through the door first. You can start out training at a door or use cones, two chairs or ring gates to simulate a door opening. These tools are common in dog training. 1. Ask your dog for a sit, and tell him to wait or stay. 2. Dog stays, you step forward, wait a second and then step back to your dog. If he stayed, tell him good boy and give him a treat. 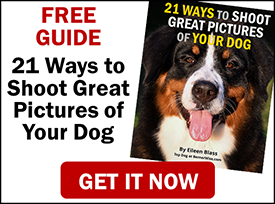 If you are clicker training, then click and treat. If he didn’t stay. Oops. Try again. 3. Once you have done this a few times successfully, it’s time to let him join you after you have stepped forward. So, sit the dog, ask him to wait. Step forward, pause and say, “let’s go” or “ok.” And allow him to join you. Praise. Practice this going in doors, out of doors, through gates, into stores, any place you can. Soon it will be routine. OK, now it’s time for a walk! Excellent video Eileen, simple but so effective!!!! Like the idea of working in a different area than the doorway!!!!!! Fabulous Eileen, my Newfy is really struggling with trying to knock me down going through the door, so I will begin training him again with your recommendations on stay/wait. Love it, Thanks! WOW VERY IMPRESSIVE TEDDY AND EILEEN 🙂 I JUST HAVE TO GIVE THIS A TRY WITH MY 5 BERNERS. THEY ARE REALLY BECOMING OUT OF CONTROL WHENEVER WE OPEN ANY DOOR IN OUR HOME THEY BOLT OUT LIKE MAD DOGS BARKING AND JUMPING AND EVEN AT TIMES GETTING INTO A LIL TIFF WITH ONE ANOTHER 🙁 NOT THE IDEAL WAY TO OPEN YOUR HOME AT ALL.